2-room apartment 55 m2, on the upper ground floor. Living room with 1 double sofabed, satellite TV and air conditioning. Exit to the terrace. 1 double bedroom. Exit to the terrace. Kitchen (4 hot plates, oven) with dining table. Shower/WC. Heating, air-conditioning (extra). Terrace 12 m2, roofed. Terrace furniture. View of the garden. Facilities: Internet (WiFi, free). 1 pet/ dog allowed. Small apartment house Vesela, surrounded by meadows. 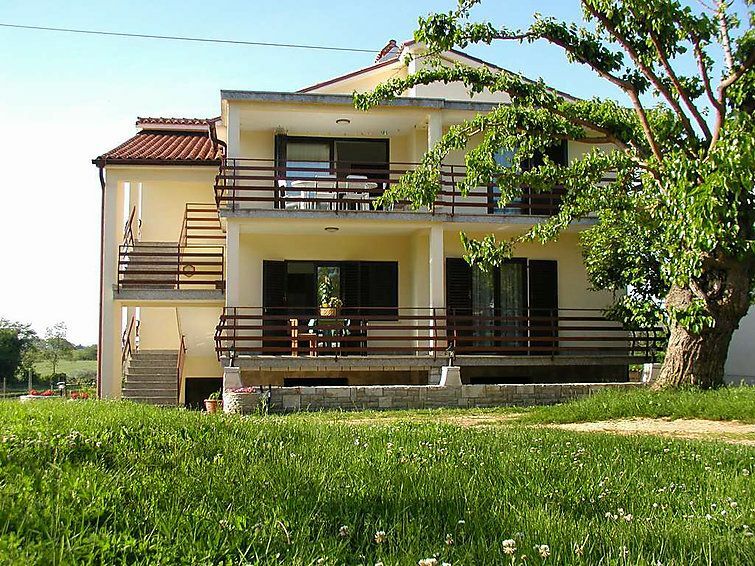 In a quiet, sunny position, 800 m from the sea, 800 m from the beach, in the countryside. For shared use: property 1'300 m2, garden with trees, meadow. Badminton, barbecue, children's playground (swing). In the house: internet access, trampoline. Parking at the house on the premises. Shop 1.2 km, restaurant 1.2 km, shingle beach 1 km, rocky beach 800 m. Golf course 3.5 km, tennis 2 km, walking paths from the house 500 m. On the children's playground badminton net.